It should be fairly obvious that racing another car at speeds of up to 110mph on any road - let alone a busy city street - is incredibly stupid, but just in case, here’s some proof. The video above was shot in the Gangbuk District of Seoul, Korea. It’s dashcam footage from a Ford Mustang, which was raced against a Mercedes-AMG A45 that we only see a portion of at the 31sec mark and a brief flash of later on. Both cars were said to be driving at speeds of up to 177kmh (110mph) in a 60kmh zone (37mph). 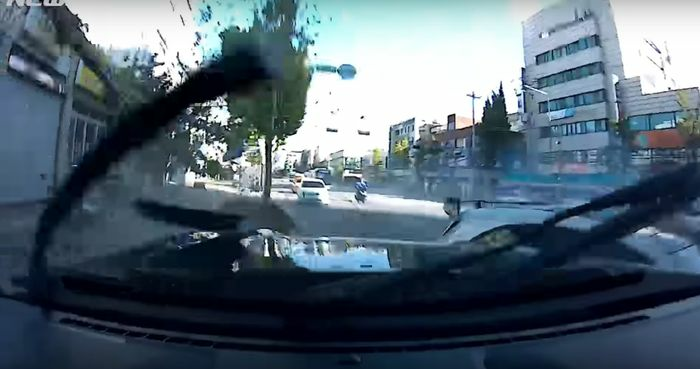 The Mustang is seen aggressively manoeuvring around traffic, before getting stuck behind a scooter. The driver then accelerates and turns sharply, hitting a fence in the process. That’s when the car spins, smashes into a tree (with enough force to cut it down) and wipes out a parked motorbike. Thankfully, no bystanders were hit when the car crashed, but this sorry story could have easily had a nastier ending.